Google has been on a quest to give its users the best experience in terms every web based service it provides, specially when it comes to its free web based Google Maps service. Over the past 7 years Google Maps has done it all, from satellite images to now recently the 360 degree street view where Google mobilised its hardware by mounting it on top of specially modified cars, trikes, trolleys and even snowmobiles to give its users a Street View of cities and even jungles of the world, but can anything stop Google in its quest to map the world? Nope. Google has taken it to the next level by unveiling what it calls the 'Street View Trekker'. 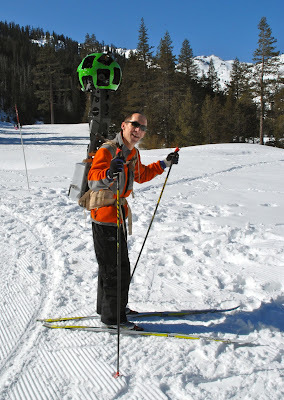 The street view trekker is a piece of hardware that's mounted on a backpack to bring you pictures of the places that could only be reached by foot. Weighing in at around 18 Kgs the Android powered hardware setup includes 15 cameras, each having 5MP of resolution, a hard drive for local storage, and two batteries that provide the hardware enough power for a full day's walk. The Captured images are stored in the hardware are later processed by Google servers and upload online to give you a street view of a trekking path. Google plans to take the backpack to canyons, national parks, castles and ruins. Overtime I think this would build up a serious and comprehensive database of various sites and sceneries across the world. This shows the fact that Google takes its work of serving information virtually for free very seriously. May God Bless Google and I hope these databases are utilised for a better and easier future for Humanity.